A story from Kolkata, India where women living in poverty have reconstructed their lives by being involved with ConneXions, a fair trade business. ConneXions is a vocational training center with the mission to create meaningful work for extremely impoverished women. This work primarily focuses on the textile industry. ConneXions exports these textiles to various western nations and sells them under a fair trade label. The impact of this fair trade can be seen in the lives of these women. The primary work here is stitching together recycled saris, the traditional women's garment. They sew together these elaborate pieces and create various types of items such as baby slings, skirts, shoulder bags, and blankets. The documentary premiered on October 8, 2010 in Bethlehem, PA. The premiere included a stand with the various fair trade products for sale, a large photo art gallery brought to you by DoSomething.org, and an after party with BEC Recordings artist Phillip LaRue. Filmed in Kolkata, India by Amanda Danziger (Ibrahim) Edited and produced by Amanda Danziger (Ibrahim) Assistant Producer Ariel Danziger Script by Jenny Scott, Ariel Danziger, Amanda Danziger (Ibrahim) Color Corrected by Bruce Kite Voice Overs by Lauren Harper Sound Mixed by Will Dickerson Translations by Jaya Mondal Featured music by Aradhna, Majestico, Charlene Ava. Total run time: 23 minutes. 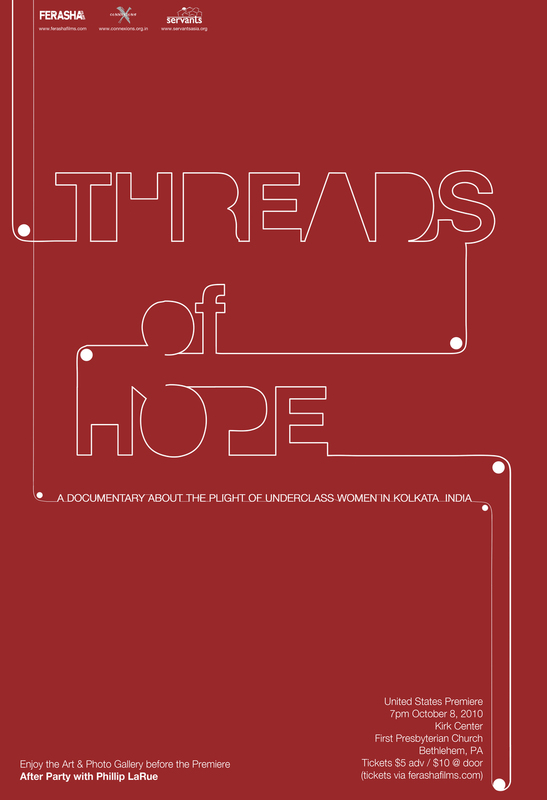 The Express Times Amanda Ibrahim chronicles India's impoverished in new documentary, 'Threads of Hope' "Drexel University student Amanda Ibrahim, of Allentown, wanted to make a difference in the world by bringing the plight of India's impoverished to the masses." Read the entire article.